We all love exploring monuments, forts and other historical figures around the country. These places hold many secrets and the oppurtunity of unravelling one of them is absolutely endearing. These monuments that have stood the test of time is all that remains with us of our wonderful past. Some of them have been honoured, others protected and yet there are those which still lay forgotten and in ruins. We take a look at five of the underrated historical monuments that stand in India which boasts of a rich history but sadly have lost all their grandeur because of lack of upkeep. Get upto 40% OFF on Makemytrip.com coupons. Kumbhalgarh Fort in Rajasthan was built by King Rana Kumbha in the 15th century. This fortress in Mewar is located on the banks of the River Banas and Tourists throng here in large numbers as it is the second most important fortress of the state. It is surrounded by 13 peaks, watchtowers, and bastions. The fort stretches across 36 km of the Aravallis and houses a domed palace built by Maharana Fateh Singh. The long winding wall was built to guard against the attacks of enemies and this wall is supposedly second after the Great Wall of China for its length. The fort has seven huge gates, the biggest among which is known as the Ram Pol. Tourists can see a temple on the Hanuman Pol, the main gateway leading to the fort. The Hulla Pol, Ram Pol, Paghra Pol, Nimboo Pol, Bhairava Pol and Top-khana Pol are the other gates of the fort. Tourists can enjoy a bird's eye view of the surrounding areas from the top of the fort. Another fortress known as Kartargarh is also located inside the main fort of Kumbhalgarh. Sadly to say though is that upkeep of this fort has not been done properly and hence much of its past splendour now lay in ruins. The Rabdentse Ruins are the ruins of the palace which was destroyed by the Nepalese army. These ruins remain as a reminiscence of the former kingdom of Sikkim. Rabdentse was the second capital of Sikkim, the first being Yuksom. They are a part of Buddhist pilgrimage circuit which consists of many monasteries. The ruins are divided into two wings - the northern wing and the southern wing. The northern wing is where the royal family resided and there is an open quadrangle where the ruins of "Dab Lhagang", the place where the royal family used to offer prayers, is situated. A view of the ruins. The Tughlaqabad Fort built in 1321 is a ruined fort in Delhi that was built by Ghiyas-ud-din-Tughlaq who was the founder of the Tughlaq dynasty. When Tughlaq became the king of the region he right away started the construction of the marvellous fort which he wanted to be one of its kind. However, the fort couldn't be built the way it was meant to as it is believed to have been cursed by a saint. This fort is the largest in the whole of Delhi and is known for its architecture which is seen in its mosques, palaces, towers, buildings and tanks. The fort was built to defend the emperor and its walls are thicker than the other forts in India. 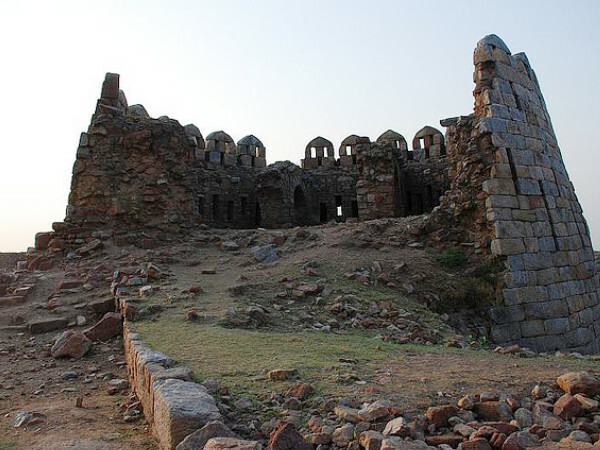 This fortified city of Tughlaqabad now lay in ruins as there is no one to see to its upkeep. The layout of the city can still be made out by the roads and streets of the city. The ruins of Tughlaqabad Fort. Bhangarh Fort, a tourist attraction in Alwar, is a medieval fort which is now in ruins and is surrounded by a wall in a partially dilapidated condition. The fort premises contain natural springs, waterfalls, gardens, Havelis and banyan trees. Temples of Lord Someshwar, Gopinath, Mangala Devi and Keshava Rai are also present here. There is also a hilltop chhatri, which is secluded from the rest of the area. This fort is believed to be haunted and tourists are asked to keep away from its premises post sunset. Though it garners lots of attention from visitors this ruined monument has lost much of its past glory and is now in a sorry state. Spooky view of Bhangarh Fort. Vikramashila University was one of the two most important set of Buddhist learning in ancient India during the Pala dynasty. It had an equal footing along with Nalanda University in the domain of Buddhist learning. It was established by King Dharmapala when he felt a decline in the quality of learning at Nalanda. The ruins of the ancient university are a sight of marvel as it is a huge square monastery with a stupa in the centre, a library building and cluster of stupas. A Tibetan and a Hindu temple have also been excavated here. Travellers come here from far and wide to explore this monument but sadly to say much of it is dilapitated and there is not much you can see here. The remains of the university.